Robert J. Gessner was born in Kankakee, Illinois and lived in the Kankakee area for most of his childhood until his family briefly moved to Michigan. Upon graduating from high school in Michigan, Gessner moved back to his hometown where he worked in his father’s factory. In 1969, Gessner began his career with the Kankakee Fire Department. He served the citizens of the City of Kankakee proudly for 30 years until his retirement in 1999. During his tenure with the Kankakee Fire Department, Gessner delivered over a dozen newborn babies, taught hundreds of paramedic students, mentored new fireman and provided a warm loving home for his family. 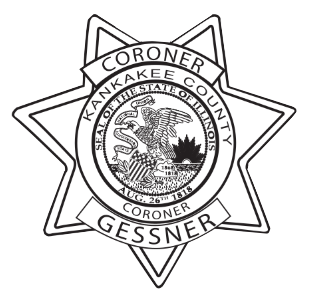 While employed by the City of Kankakee, Gessner also started working part-time for the Kankakee County Coroner’s Office in 1984. Gessner held the title of Deputy Coroner until 1999 when he was appointed Chief Deputy Coroner under former Coroner Dr. James Kelly. When Coroner Dr. Kelly retired in 2003, Gessner was appointed by the Kankakee County Board to serve as Kankakee County Coroner. He was first elected to the position in 2004 and has been successfully re-elected in 2008, 2012 and 2016. Coroner Gessner is a member of the Cook County Disaster Team, the Illinois Coroner’s and Medical Examiner’s Association where he has served as the Secretary since 2003, the Illinois Department of Public Health Maternal Mortality Review Board, the Eastern Illinois Law Enforcement Administrator’s Association, the Illinois Department of Homeland Security Board, the Kankakee Chapter of the NAACP, the Kankakee Country Club and Governor Bruce Rauner’s Opioid Task Force. In 2018, Gessner was selected by The Daily Journal as the 2017 Citizen of the Year. During his tenure as Kankakee County Coroner, Gessner has led the charge across Kankakee County to educate people on the importance of seat belt usage, obeying the speed limit, not drinking and driving, not texting and driving and more recently the dangers of drugs especially opioids. Thousands of students from all across Kankakee County have heard Coroner Gessner stress the importance of wise decision making. Coroner Gessner was also instrumental in the design and construction of the Bryan R. Mitchell M.D. Forensic Center, which enabled the Kankakee County Coroner’s Office to work in a state of the art facility with cutting edge technology all of which benefits the citizens of Kankakee County. Eric Cavender joined the Kankakee County Coroner’s Office in December of 2008. In June of 2014, Eric was appointed as the Chief Deputy Coroner. Eric is a 2008 graduate of Momence High School, a 2010 graduate of Kankakee Community College (Associate of Applied Science), a 2011 graduate of Carl Sandburg College (Associate of Science Degree – Mortuary Science and Funeral Service) and a 2018 graduate of Olivet Nazarene University (Bachelor of Science – Criminal Justice). He is a licensed funeral director and embalmer in the State of Illinois. Eric has completed the Medicolegal Death Investigation Training Course basic and master level class through the St. Louis University School of Medicine. He has also completed the Command and General Staff class, Practical Homicide Investigation Course as well as many other death investigation classes. In addition, Eric is also lead homicide investigator certified. Eric is a member of the Cook County Disaster Response Team, The Illinois Coroners and Medical Examiners Association, The Hundred Club of Kankakee County, the Eastern Illinois Law Enforcement Administrators Association where he serves as the Secretary, St. George Catholic Church and the Kankakee County Republican Central Committee where he serves as the treasurer. Eric is married to Kaitlain and lives in Bourbonnais. Mark Posing began his career as a local firefighter in 1984. During his time as a firefighter, he was certified as a fire service and EMS instructor for the State of Illinois. He was also trained in hazardous materials operations and technical rescue. In April of 2004, Mark joined the Coroner's Office as a Deputy Coroner, bringing with him his extensive medical and fire knowledge. He has since attended Medicolegal Death Investigation Training basic and master level classes through the St. Louis University School of Medicine. He has also completed the NIMS IS-700. In November of 2017, Mark retired from the Naperville Fire Department to accept a full-time job with the Kankakee County Coroner's Office. William Perkins began with the Coroner's Office in February of 2007. In conjunction with working for the Coroner's Office, he also works full time as a Battalion Chief with the Manteno Fire District. He has over two decades of experience in fire and emergency medical service. He has extensive training in hazardous materials, is a fire service instructor, and has completed Basic Mandated Firearms Training, Medicolegal Death Investigation Training, and National Fire Academy Command and General Staff Training. He has also completed the NIMS 100, 200, 700, and 800 courses. Thomas Rath has been a firefighter since 1991 and became a licensed Paramedic in 1994. During his career as a firefighter he obtained State of Illinois certifications as Instructor I, Hazmat Operations, Lead Paramedic Instructor as well as NIMS 100, 200, 700 and 800 courses. In February of 2012, Thomas joined the Kankakee County Coroner's Office as a part time Deputy Coroner and in August of 2014 he became a full time Deputy Coroner. Thomas has attended the Medicolegal Death Investigator Training Course at Saint Louis University and the Lead Homicide Investigator Course. In 2014, Guy Maisonneuve was hired part time at the Kankakee County Coroners Office. Guy works full time for the Kankakee Fire Department and brings extensive knowledge of the fire service to the Coroners Office. Guy is married and is a resident of Manteno. Bryan has fourteen years of serving the public with employment in the Public Safety field as Firefighter / Supervisor and Emergency Medical Technician. He is a Captain with the Kankakee Fire Department, and also a firefighter paramedic with the Braidwood Fire Protection District as well as a fire investigator and a fire service instructor. Some of the certifications which he holds are: Command & General Staff Functions for Local Incident Management Teams, Certified Fire Investigations, NIMS 100,200, 700, 800. Bryan also hold multiple certifications in Hazardous materials response, and Technical Rescue. Lindsay Jones started her career with the Kankakee County Coroner's Office in June of 2018. Lindsay had previously worked for the Kankakee County Clerk's Office and has extensive knowledge of the Illinois Vital Records System. She is married and the proud mother of three young children. Lindsay and her family live in Bourbonnais.